Authorities imposed restrictions in parts of Srinagar city in Jammu and Kashmir on Monday to prevent a separatist called protest march. 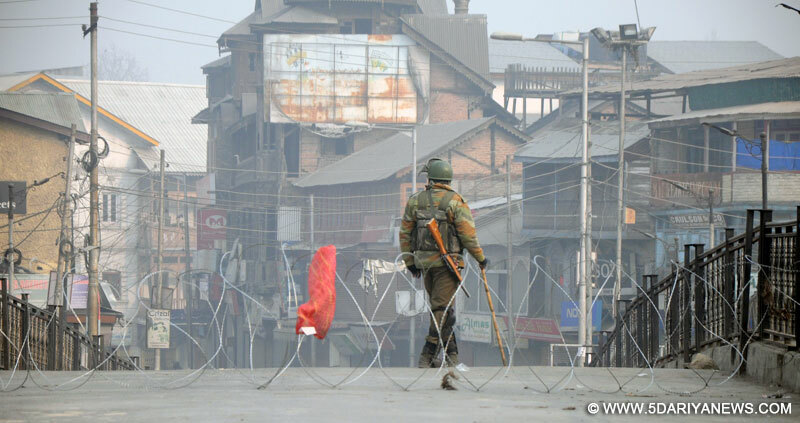 "Restrictions will remain in force today (Monday) in and around Lal Chowk area to maintain law and order in the valley," a police official told IANS here.According to the official, section 144 of the CrPc (Criminal Procedure Code) that deems an assembly of five or more persons as unlawful is already in force in Srinagar.Monday's restriction is intended to prevent any clash between the law forcing agencies and the protesters, the official added.Senior separatist leaders -- Syed Ali Shah Geelani, Mirwaiz Umer Farooq and Muhammad Yasin Malik -- are scheduled to lead a protest march to Lal Chowk on Monday, according to the weekly protest calendar the separatists have been issuing in the valley to continue the five-month long protest shutdown here. While Geelani continues to remain under house arrest in his uptown Hyderpora residence here, authorities on Monday placed Mirwaiz Umer and Yasin Malik under house arrest in their Nigeen and uptown Maisuma residences respectively.The intensity of the separatist campaign has gradually been decreasing since it started here on July 9, a day after Hizbul commander Burhan Wani was killed in a gunfight with the security forces.Many shops, all public transports and some private transports have been functioning in the valley despite the separatist called shutdown.The situation is a far cry from where it started when the valley literally remained paralysed because of the shutdown.Complete normalcy has still been eluding the valley except on Saturdays and Sundays when the separatists allow full-day "relaxation" in their protest calendar.